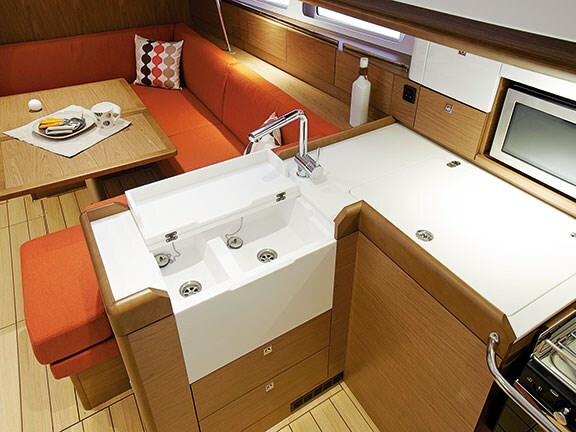 The latest Jeanneau Deck Saloon successfully incorporates big-boat features into a functional 40-foot package — easily sailed, comfortable and spacious. 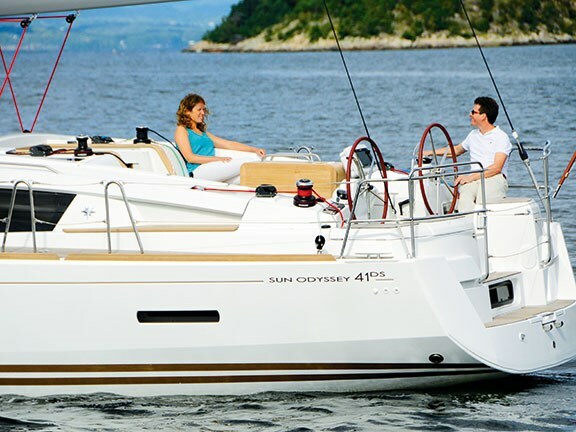 The entry-level model of the Sun Odyssey Deck Saloon range offers cruising sailors space and comfort at a size a couple can easily handle. 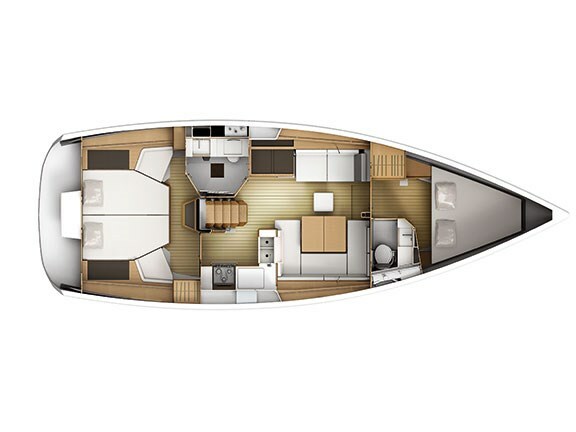 Jeanneau's Deck Saloon concept raises the interior to allow views through the company's signature teardrop side windows, which, combined with portlights, gives a very airy feel below decks. It's all about the owner in the two-cabin layout, with the entire stern section devoted to the king-size bed, while both cabins have en suite bathrooms. This means the cockpit is also raised, about 35cm higher than its cousin, the Sun Odyssey 469 that was moored alongside us. I tested the 41's predecessor, the 42DS, in 2010, finding very little to complain about and a lot to like, so the latest model was expected to be similar. However, the 41 has rung the changes, starting with the 40.5-foot hull, transformed from the original Marc Lombard design to Philippe Briand. 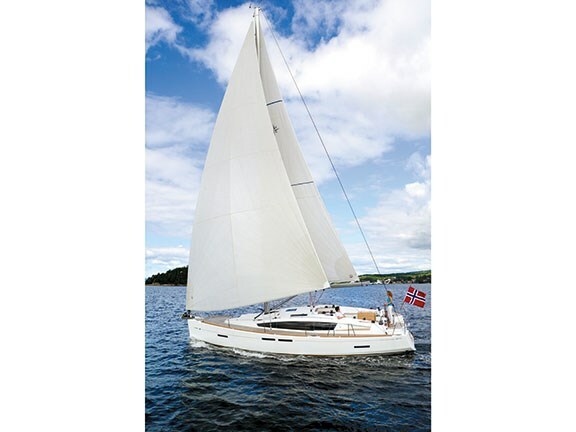 In fact, it is the well-proven Sun Odyssey 409 hull that won 2011 European Yacht of the Year in its category, along with its rig, keel and rudder. The fairly large cockpit is dominated by the substantial wood-clad table that some may say is too big, but it's good for bracing against in a seaway. Deep coamings protect you from the weather and, with the optional spray hood plus bimini, will make for a good cruising set-up. A conventional winch layout has two Harken 40s on the cabin top for dealing with all halyards emerging from the guttering either side, while the H46 primaries are further aft within reach of the binnacles — somewhat too near for a dedicated trimmer, maybe, but good for me when I easily trimmed and steered during our sail test. 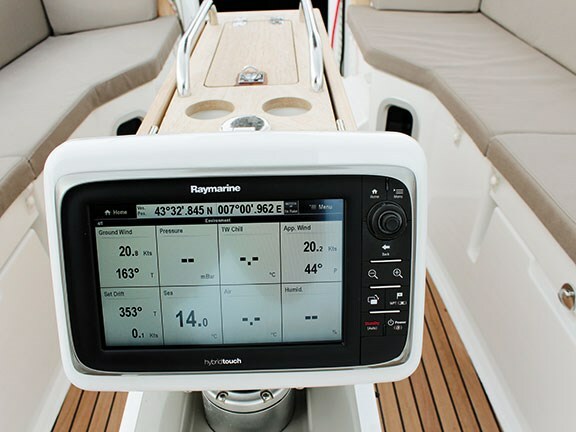 Thankfully, avoiding the convention followed by some competitors of relegating them to obscure places, the compasses on the 41DS are prominently displayed, along with the Raymarine ST70 instruments and centralised HybridTouch plotter on the table end. An open transom with stepped bulkheads leads to the swim ladder. Plenty of sidedeck space means moving forward is easy, while flush hatches and hidden halyards give a clean look. Anchoring is well taken care of with twin rollers leading back to the below-deck Quick 1000W vertical windlass (with handheld remote and manual handle) housed in a deep chain locker. Other good points include a sturdy wooden toe rail, oversized cleats including midships, and optional teak deck, which is lovely if you can budget for it. Our review boat was fitted with the Performance sail plan: a Mylar/taffeta tri-radial 106 percent furling genoa and similarly constructed 70m² Code-0 on a lightweight furler. The high-aspect ratio rig can also fly a 109m² asymmetric spinnaker off the pulpit and there's a self-tacking jib available — a good option for general cruising when shorthanded but underpowered for tropical sailing. 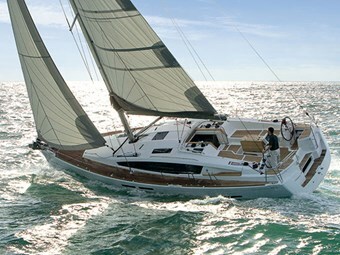 As standard, the mainsail is an in-mast furling type, confirming the cruising credentials of this boat, and the German mainsheet system allows trimming from both sides. 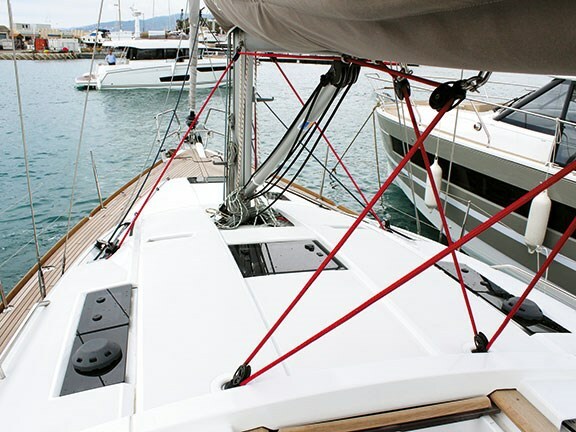 Interestingly, the alloy Sparcraft rig is supported by a carbon PBO twin backstay, while the inboard shrouds were conventional wire with tie rods connected into the internal structural grid. A solid boom vang completes a good rig set-up allowing plenty of versatility in the sail wardrobe. Moving below (I'm very pleased to see an adjustable-height washboard on the main hatch rather than the in-vogue saloon doors) shows a traditional-looking interior, but first impressions can be misleading. The views from both the large side windows and rectangular portlights is what the Deck Saloon concept is all about — there are 10 opening hatches providing the 41DS with good natural light. For this model, the company engaged interior marine design specialist Franck Darnet to add some je ne sais quoi. Along with in-house specialist Olivier Flahault, they have created some smart but functional details. These start with the chaise lounge-style sofa with angled cushions that transforms into a berth and a movable stool at its end — although I'm not sure how this stool would work at sea for the skipper to use at the adjoining navigation station. The latter is a sizeable table with storage, but bulkhead space is minimal for plotters and the flatscreen television shares this space as well. Under the table was the optional wine fridge, but this could be a Jeanneau-supplied mini dishwasher or washer-dryer instead. Other good points include sturdy leather-covered grabrails and wooden handrails running fore and aft. In the dinette, the telescopic table leg converts the area into lounging or sleeping space. Overhead, touch-latch cupboards look chic. White-lacquered ones in the L-shaped galley match the double Corian sink and cover, transforming it into a large working surface. A twin-burner stove/oven with nearby microwave and 185-litre top-opening fridge takes good care of cooking basics. Wood finish is walnut with alpi elsewhere, all nicely sanded and rounded at the fiddles and door jams. The marine ply flooring is laminated in a type of Formica with wood-grain groove, which looks to be rugged enough but I would question its non-slip properties when wet. Lighting is sensibly LED throughout, giving an effective but atmospheric glow in the evening with similar spotlights at the berths. Overall construction and finishing is of a good standard throughout. 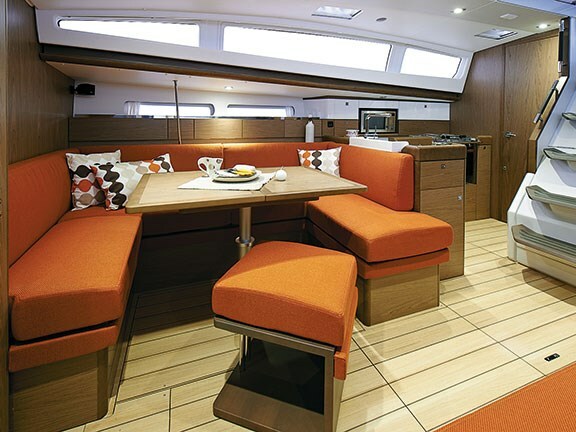 The owner's cabin dominates the layout of this boat, encompassing the entire aft section behind the main hatch. It features an enlarged double berth (1.97 x 1.9 x 1.2m) — a major selling point of this design. The opening portlight in the transom greatly helps to lighten this otherwise dark bed space, while tasteful lamps add to the comfy ambience. Infills on either side create yet more lounging room, and headroom in the walkway is over six feet. Further ticks include twin wardrobes and other drawers, providing plenty of storage for prolonged cruising. There's access to the engine filters from here, which, combined with the front under-ladder access, ensures the 40hp Yanmar's service points are reached. Mains power controls are beside the berth under the cushion side infills. Batteries are twin 110amp/h, serviced by a 60amp/h charger, and there's room for a four-kilowatt Onan generator to run white goods at sea, including the optional air-con. The en suite is sizeable with voluminous sink and integrated work top. A Plexiglas door separates the moulded head from the tall shower area, while lacquered cabinetry is easily cleaned and there's the obligatory opening hatch. 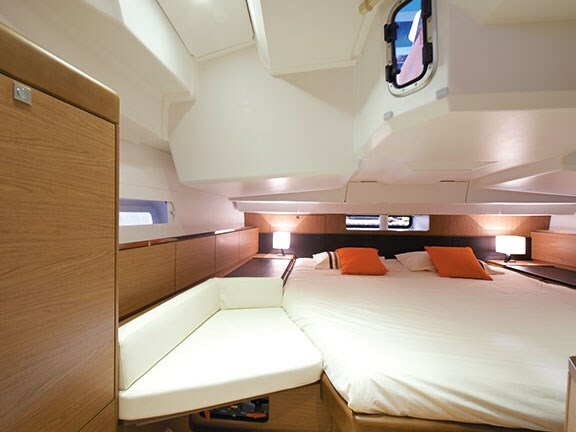 The forward berth has a simple flip-up headboard, allowing you to rest feet forward — the safest way to sleep when underway. The step down to both fore and aft berths from the raised saloon can be a hazard if forgotten when striding around. The fore hatch is a curved window developed by Jeanneau in conjunction with Lewmar, allowing occupants to have some degree of forward viewing. Bathrooms are similar in standard to the owner's. 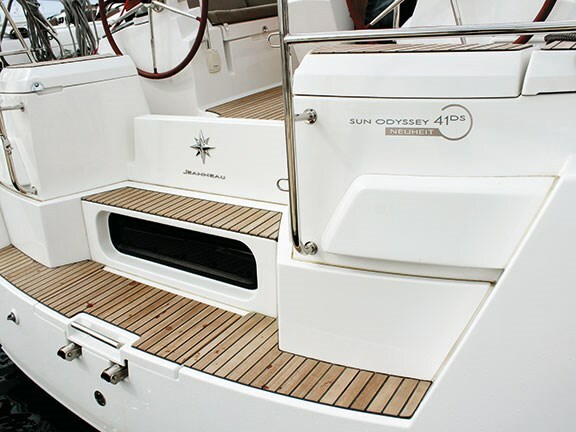 The hard-chined Philippe Briand hull is hand laid in solid laminates with an injection-moulded deck. Interestingly, the lining, traditionally glassed-in afterwards, is now incorporated in the hull mould, which should increase rigidity. The raised saloon allows deep bilges — an important safety feature in case of flooding — but also an ideal location to house upright wine bottles. The keel is a conventional cast iron fin, in deep or shoal versions, with deep spade rudder. Motoring out of the harbour I cranked the 40hp Yanmar up to full revs (3200rpm) and watched as our SOG climbed to 8.1 knots on the Raymarine HybridTouch, with the three-bladed Flexofold prop causing little vibration or turbulence on the twin stainless steel Lewmar steering wheels. Setting sail went without a hitch. I climbed on the coachroof to unzip the sailbag from its lazy jacks before throwing a few turns around the electric Harken 40 to hoist the main. Similarly, the big Code Zero unfurled easily once the twin furling lines had been released from their sturdy jammers at the cockpit. As on all recent Jeanneaus, the sail plan and running rigging are robust and effective. Seated comfortably on the teak gunwale, I settled in to make the best of the fickle 5.1-knot breeze and was impressed as the 41DS slid along to reach 4.2 knots hard on the wind at 40 degrees. As we slid between the islands off Cannes, the pressure increased to a more usable 8.7 knots, speeding us along at 6.7 knots. Most cruisers would be expending diesel in these conditions so the Code Zero is a worthwhile option, and when tacking this relatively lightweight sail slid easily through the slot between it and the genoa. The Lewmar cable linkage gave enough feel and response to make steering enjoyable and the teak cockpit sole was surefooted when moving between the helms, the low side being the best position for seeing the telltales on the Code Zero. Turning our bow away from the Antibes peninsula, I threw in a few gybes, easily taking in some of the German mainsheet while the 41DS turned speedily as I spun the wheel, with only a few extra tugs on the Code Zero sheet to pull it around as well. On a forty-footer it's arguable how essential Jeanneau's 360 Docking is, but it definitely reduces the stress of berthing in a busy Med' marina when the Mistral is blowing, as I found out. The result of a collaboration with ZF Marine and Yanmar, 360 Docking is available across a wide range of Jeanneaus and the uptake rate has been strong with about 70 percent of new owners choosing it, according to Erik Stromberg, director of product development. Taking 1.6 seconds to swivel the prop into the desired direction, the joystick is moved at 90-degree angles then twisted to increase the revs — a very intuitive system. It's particularly useful for holding station. Just add a touch of bow thruster going sideways and no dramas should ensue. In short, the 41DS is very much a sailor's boat and doesn't let clever aesthetics cloud the fact everything should work effectively and be robust. For more information visit jeanneauaustralia.com.